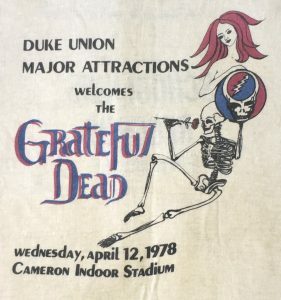 40 years since the April 1978 show at Cameron Indoor Stadium, the 4th of 5 the Dead played at Duke between 1971 and 1982. Fun started early as a ticket line formed 2 days prior to the on-sale date at Cameron. Duke was a more open, accessible campus in ’78; some folks slept in cars & a van. Great scene in the nice spring weather included a just-for-fun high jumping contest in Wallace Wade Stadium. 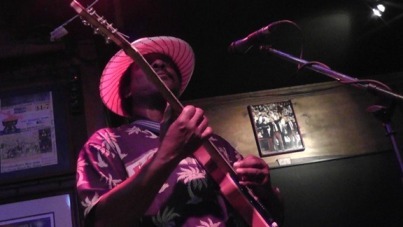 The show featured Garcia at his most animated & emotive, and memorable interaction between band & audience. A pro-shot video made by a student group, missing from the Duke archives for years after the show, eventually resurfaced – see clips below. Among the highlights: the prettiest “Peggy-O”; “turn down the lights” chant from the audience and rap from Weir & Lesh (funny) followed by a plaintive, wailing “Row Jimmy”; Jerry beaming on “Bertha > Good Lovin’ “ with perfect solos, almost yodeling “heard a voice a callin’ “, and crowd erupting during “Good Lovin’ ” crescendos; Jerry windmills (!) on “Truckin’ ” & “U.S. Blues” and dancing throughout. Video shots from the rear of the hall catch arm-waving audience reactions. Regarding the house lights – after the Dionysian fest that was the 12/08/73 show at Duke, the school administration opposed Major Attractions’ subsequent (successful) efforts to bring the band back (’76, ’78, ’82). The ’78 house lights were likely part of that skirmish. I talked with Jerry in a backstage locker room after the show. Did he think he’d ever play pedal steel again? No, he said, there were already so many other more-accomplished players*. Better, he thought, to master one instrument and try to achieve transparency between him and the guitar. The knobs & effects he was adding were part of that, allowing him to play more-freely without mechanically creating those effects. He talked about a place he went, in his mind, on “those” nights, when he wasn’t consciously aware of playing and the trappings of the show disappeared. “You know what I mean?” I did. At those times, he said, he was often standing on a hill overlooking a wheat field, and when he returned to the stage he was unaware of how much time had passed. This entry was posted in Concert, Musicians, Reviews, Videos and tagged 04/12/78, Bob Weir, Cameron Indoor Stadium, Duke, Grateful Dead, Jerry Garcia, pedal steel guitar, Phil Lesh by Steve Haughton. Bookmark the permalink.